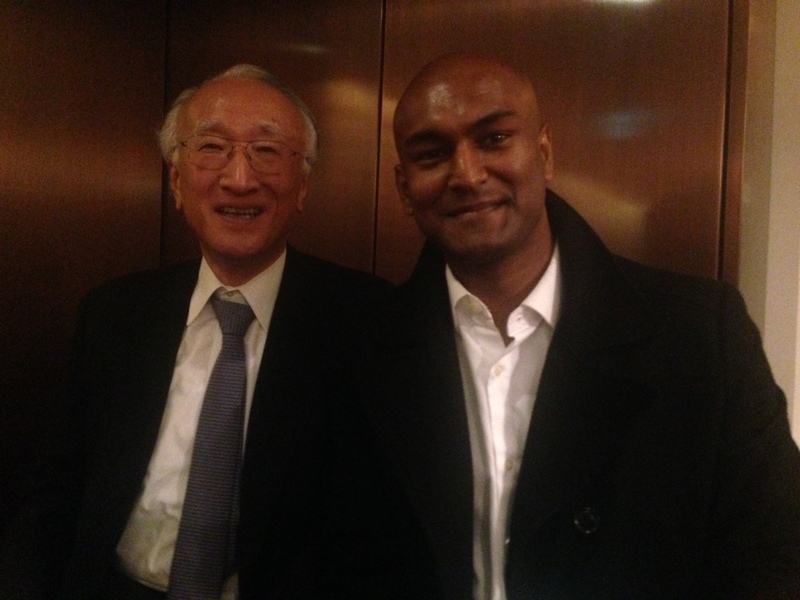 Here is a short recount of my personal impressions of an event organized by the University of Tokyo – Graduate School of Public Policy under its “Global Leader” program. The event was held at Hongo campus’ Ito Hall and lasted all day long with several presentations, keynotes, speeches, movie presentations and panels. 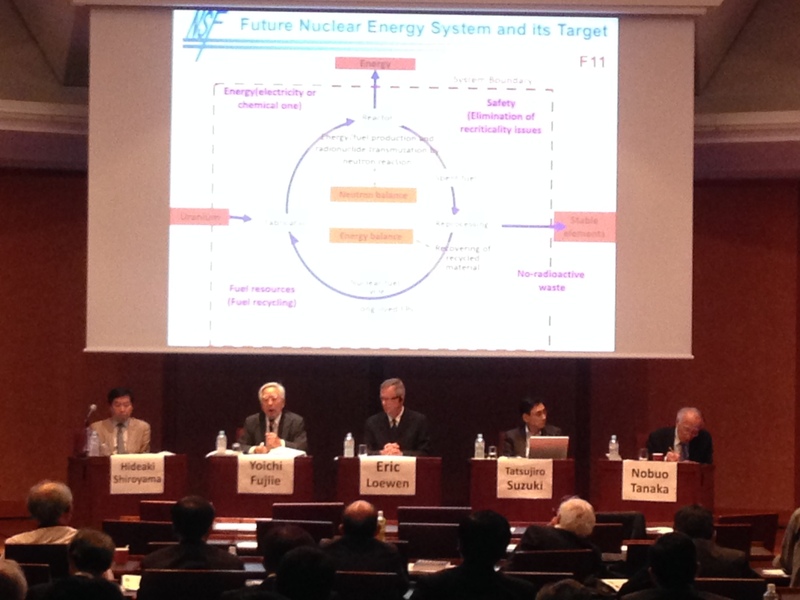 The event’s main theme was nuclear power and the main topic revolved around “Peaceful and Safer Use of Nuclear Power: Role of Integral Fast Reactor“. This nuclear reactor fission technology and design have already been in existence for more than 50 years, but throughout the entire period of commercial use of nuclear power, other reactor designs were preferred, mainly for cost or convenience reasons. However, after the 2011 Fukushima Dai-ichi disaster and the gradual meltdown in 3 of the plants 4 reactors (the adjoined Fukushima Dai-ni was virtually unaffected by the earthquake, tsunami or nuclear complications at it’s sister plant) led to a search of more safe and viable options for Japan’s future energy mix. The Integral Fast Reactor (IFR), a design by US conglomerate General Electric (promoted in Japan in conjuncture with its partner Hitachi) is supposed to be a safer and more efficient reactor type that will reduce the risks emanating from nuclear power generation to a relative minimum. The reactor type is considered a passive system as opposed to active ones. This means that the reactor is cooled through a closed system that does not require active cooling and will immediately and automatically shut down in a case of emergency. This would reduce the risks of meltdown significantly and could thus be operated also in country like Japan, which is historically exposed incessibly to natural disasters. To provide more backup to their arguments, the proponents of this technology presented a documentary called “Pandora’s Promise” by director Robert Stone (for detailed information see http://pandoraspromise.com/). This movie tells the story of former environmentalists, who confronted with the threat of global warming and air pollution among others, decided to revise the initial anti-nuclear to pro-nuclear views. The movie provided an emotional discourse on why mankind, especially in developed countries, should not abandon nuclear power and should reconsider its anti-nuclear stance to the benefit of a greater good. Having assisted at this seminar, having listened to the arguments of the proponents, having read the profiles of most presenters and keynote speaker and panel participants, I have to say that this whole event leaves kind of a bitter taste for me. I am open to every technology that will make energy safer, cleaner, more sustainable and more accessible. Costs are are something that needs to be considered if we are debating which technology should be preferred over other for our future energy and electricity generation. However, I felt that this event was more or less a publicity event for the nuclear industry that tries to comfort people again after the general public has become much more cautious towards the government, the electric utilities and nuclear power in general. Not a day goes by without new disconcerting information being released about the troubles and complications at the Fukushima Dai-ichi plant, and the government’s and TEPCO’s handling of the situation. This is the absolute opposite of what was presented at this seminar. I am aware that nuclear power is a business and that electric utilities want to make money, which is a legitimate goal. However, I have a hard time trusting the words of the people that said the same things about nuclear power decades ago, companies that tried to hide and falsify information for years, and politicians and experts that failed to regulate and control the nuclear sector appropriately. The University of Tokyo is a public institution with a public mandate to engage in unbiased research. And although I do also reckon that universities and researchers are reliant on private funding from corporate sponsors as well, it should be assured that both views, pro and con, do get enough exposure during an event such as this. Nonetheless, I sincerely do want to thank the organizers of this event for providing me with a lot information and providing me interesting views, opinions and perspectives on an industry that is often managed rather silently. I learned a lot and was able to engage in enriching discussions with some of the most proficient people and experts in this field. However, I would have appreciated a more differentiated discussion of this controversial and currently highly emotional topic. GPES Seminar with focus on Biology presented by Prof. Tobias I. Baskin of the University of Massachusetts, Amherst. The title of this seminar will be: “Plant growth: Scaling up from cell to stem” and will be mainly about plant cytoskeleton ( they use it to stabilize their cells and transport substances inside and outside of the cells). However the seminar will also be of interest to those without a biology background since he said he will start his talk from a sustainability perspective and will try to make it as easy to understand as possible for non-bio students. So don’t miss out on this opportunity. Please find a link below to an international conference that might be of interest to some of you. The conference will be held from August 19-20, 2014. One thing I have been beyond grateful for in GPES is the freedom to select my laboratory and professor-in-charge. Research is everything here in Todai; as a Masters/PhD student, your lab will probably be where you spend most of your time at. Since arriving here and becoming a part of Dr. Yusuke Yokoyama’s lab, I’ve been given so many opportunities I didn’t expect to have as a Masters student. 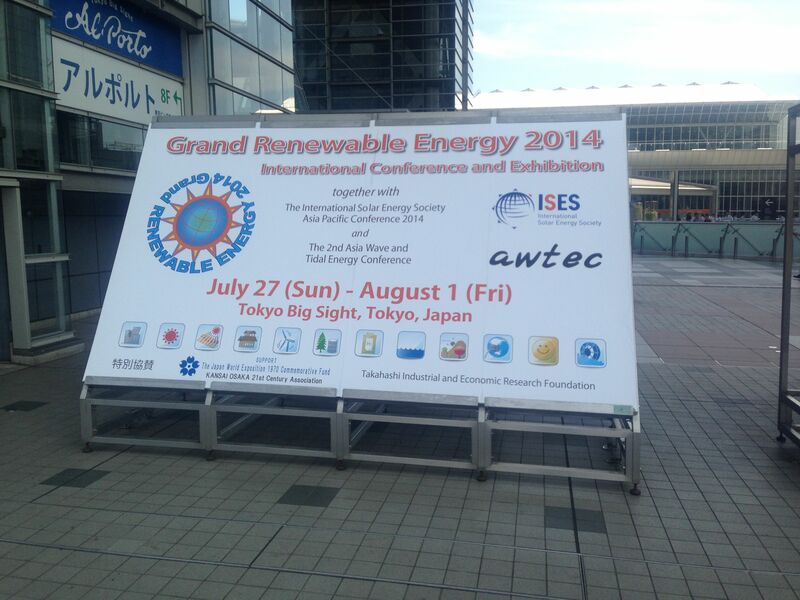 This year, we were privileged to attend the Japan Geoscience Union (JpGU) Meeting 2014 at Pacifico Yokohama. It was my First Ever Conference (though I did go for the Symposium on Polar Science at the National Institute of Polar Research last year) so apologies if I sound like a complete nooblet. The conference showcased all aspects of geoscience, including planetary sciences, geomorphology, biogeosciences among other topics. Apart from the talks that focused on oceanic biogeochemistry, I was particularly interested in the NASA and JAXA ones. These made use of a Very Very Cool state-of-the-art hyperwall (basically a massive screen – check it out here) to detail the Even Cooler technology that goes into creating and operating the consortiums of currently orbiting satellites and the multitudes of impacts they have on earth science and human society in general. One fact I was pretty struck by was that the number of precipitation measuring instruments we have on Earth is only enough to cover 2 basketball fields. We take the accuracy of weather reports for granted but this wasn’t the case till a few years back – one actually had to look out the window to decide whether to put on wellies or flip-flops! People think space exploration has no real impact on earthly life but it really does. It’s not all astronauts vaulting through space stations singing Bowie songs…though that definitely isn’t what space exploration is about either. Back to the conference: it’s structured like a music festival. Multiple talks proceed concurrently throughout the days in different rooms, you have to pick and choose which ones to go to. 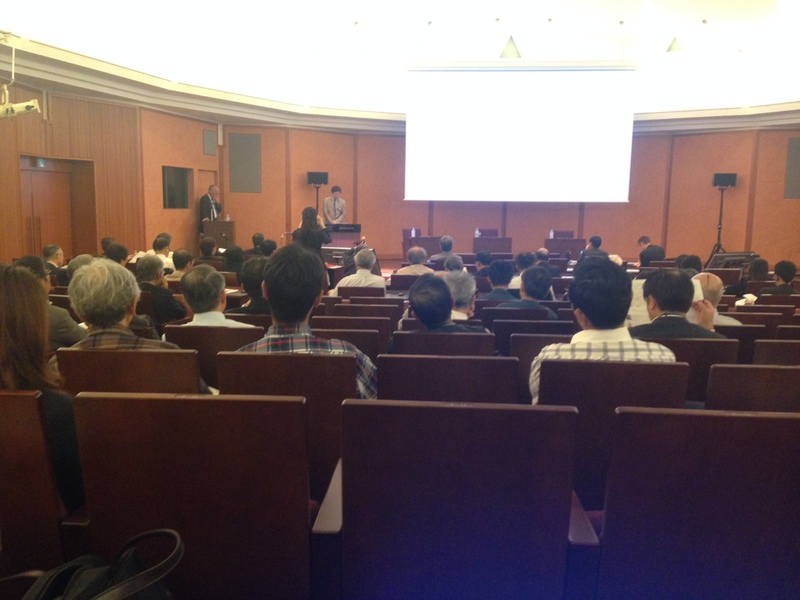 As JpGU is at its very heart a Japanese conference, most of the talks were given in Japanese; they did however have quite a few sessions in English to cater to an international audience. There are also poster presentations so that you get a quick overview of a wider variety of research without having to attend the relevant talk. Relevant organisations such as the Kochi Core Centre, Springer and even Todai had booths where you could chat with the personnel and learn more about their research and what they do, buy geoscience-related texts or even cookies that look like geological formations (I have to admit I bought the tea-flavoured cross-bedding one! Yum!). I also had a peek at a core sampled from a site that showed the geological deformation due to the 2011 Tohoku Earthquake. Scary but really interesting from a scientific point of view. On the whole, I thought it was extremely well-done and subverted the image I had of conferences being pretty stuffy and boring. It gave me an opportunity for exposure to other forms of geoscience completely outside of my research area and also to be in the company of such esteemed members of the international Earth Sciences community, many of which had a hand in the IPCC 5th Assessment Report or even the Mars Curiosity Rover. Looking forward to JpGU 2015!